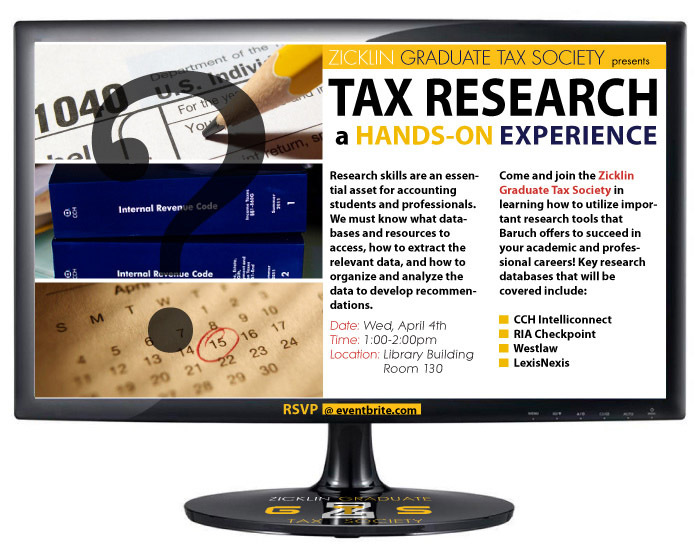 In this research workshop held by the Zicklin Graduate Tax Society, students received hands-on experience in using tax research databases such as CCH Intelliconnect, RIA Checkpoint, Westlaw and LexisNexis at personal computer stations. They learned how to access, search for, organize, and analyze data on tax issues. The first annual Tax Research Workshop hosted by the Zicklin Graduate Tax Society, it is set to be a recurring fixture in the ZGTS event lineup with plans to expand into a series of workshops with varying levels of depth, difficulty, and coverage. Thanks to everyone that participated and either gained new skills or improved current ones for their professional careers.